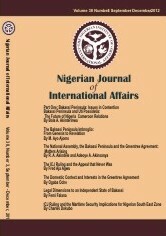 The Nigerian Institute of International Affairs is calling for Articles for possible publication in the Nigerian Journal of International Affairs (NJIA) and the Nigerian Forum. The NJIA is the peer-reviewed flagship journal of the Institute. Submission of articles is invited from scholars, professionals, policy makers in international relations, foreign policy, international politics, economics, jurisprudence, etc. Manuscripts submitted should not exceed twenty-five (A4) pages, typed, double-line spaced in MS Word format. All citations should be automatically inserted at the end of each page as footnotes. Book reviews should not exceed four (A4) pages, typed in double line spaces, while review articles should not exceed fifteen pages. The Nigerian Forum is the opinion journal of the Institute. Kindly send your article on any contemporary and topical issue. The manuscript should be between 10-15 pages on A4-sized paper.